How did a prisoner of war survive six years and eight months of soul-crushing imprisonment and torture in the Hanoi Hilton during the Vietnam War? By writing poetry. And how did he do it without pencil or paper?Then-captain John Borling ”wrote” and memorized poems to keep his mind sharp and his spirits up. He shared his creations with fellow captives by their only means of communication–the forbidden POW tap code. Rapping on the cell walls with his knuckles, Borling tapped poems–certainly of pain and despair, but also of humor, encouragement and hope–to keep everyone’s strength and spirits alive. 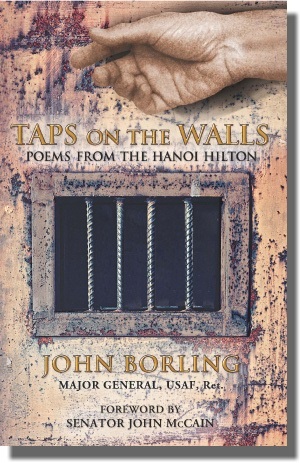 With a foreword by fellow POW, Senator John McCain, Taps on the Walls contains all the poems General Borling created during his confinement. Readers will discover remarkable stories of endurance, life lessons, and means to achieve personal triumph. The pen is truly mightier than the sword. No matter that the pen was only a mind and scarred knuckles and the sword, painful and interminable captivity. Order via Amazon.